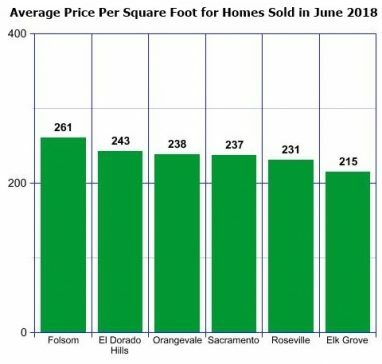 So, for the past 6 months the average price per foot for homes sold in Folsom has ranged from $253 to $262, with June sales averaging $261. That’s about a 6% increase from last summer’s prices. Of course, smaller homes sell for more per foot than larger ones, and homes under 2000 sq ft sold for an average of $300 per foot in June. 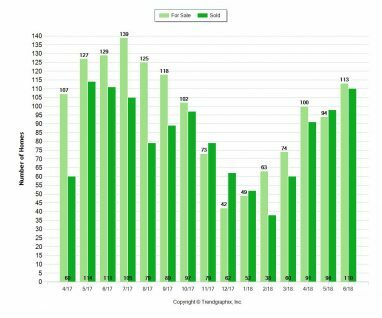 There were 129 homes for sale in Folsom in June of last year, and 113 this year. July isn’t much better, with 118 on the market in Folsom today. Sales are still strong, with 110 closed in June, compared to 111 in June 2017. These trends are similar to other communities in the region, with inventory still down, sales still strong, and prices up slightly. With world class community amenities, great schools and overall quality of life, Folsom home prices remain the highest in the region, on a price-price-per-foot basis, with the exception of the smaller community of Granite Bay, with their 35 sales averaging $283 per square foot in June. Looking to the future, where’s this all going? What about this bubble we keep hearing about? As I’ve said before, in my 15 years of selling homes, and even before that, I can’t recall a time when seemingly half of the experts, and ordinary citizens didn’t believe the market was about to crash. Even in 2012, when prices hit bottom and started to rise, the naysayers were saying the recovery was a temporary bump, and the worst was yet to come. That was 6 years ago, and the average price per foot was at $148. Still, what goes up, must come down, right? The questions are; when will it happen, what will cause it, and how far will prices come down. What I do know is that the 4 major cost factors in building homes; land, materials, labor and regulations, all cost more today than ever, and the demand for housing is greater than ever. Toss in low unemployment, low interest rates, tight lending regulations and a growing population, the train shows no sign of slowing down. I need a roof over my head no matter what the economy is doing, and today, I’m either going to pay high rents or a high mortgage payment. For more info, or if you’re interested in buying or selling this area, drop me a line. See Folsom homes for sale here. I do believe we are in a bubble, however, we are in a very unique situation. The biggest factor driving our prices (along with the ones you mentioned) is bay area transplants. Their housing has gotten ridiculously expensive. Combine an attractive Folsom lifestyle with a SF folks wanting a "better life" with less crowds, less traffic, and less feces (yes, i said it) and our housing will continue to be strong. Did you catch the story the other day that 40% (!) of SF homeowners are considering moving in the next five years? Really, the only thing I can see putting a significant crunch on prices would be a substantial interest rate increase. Once again, we will luck out as SF people have a lot more cash equity. South of 50 development will have an impact on our desirability, but that is hard to quantify. I do know that I had a discussion with a couple in Granite Bay that were sorry they moved there rather than Folsom. They still get in their car to drive here to walk or ride bikes on the trails. It's all academic and numbers on paper until the day you decide to sell. I do believe we are in a bubble, however, we are in a very unique situation. The biggest factor driving our prices (along with the ones you mentioned) is bay area transplants. Their housing has gotten ridiculously expensive. Combine an attractive Folsom lifestyle with a SF folks wanting a "better life" with less crowds, less traffic, and less feces (yes, i said it) and our housing will continue to be strong. Did you catch the story the other day that 40% (!) of SF homeowners are considering moving in the next five years? Really, the only thing I can see putting a significant crunch on prices would be a substantial interest rate increase. Once again, we will luck out as SF people have a lot more cash equity. South of 50 development will have an impact on our desirability, but that is hard to quantify. I do know that I had a discussion with a couple in Granite Bay that were sorry they moved there rather than Folsom. They still get in there car to drive here to walk or ride bikes on the trails. It's all academic and numbers on paper until the day you decide to sell. Joe, I love my city by the bay, but I can't see how people are still flocking there with the crowding, traffic, crime, 7500 homeless sleeping on the streets, and yes, pooping there too. As for prices, you are correct that an interest rate increase could change the game, particularly if there are large jumps. We are close to or at 2005 pricing levels now. Back then, we were nearly at 7% interest. I remember clients borrowing $500k at 6.75%. That's a payment of $3243 per month. Today, we're about 4%, which bring a payment of $2387. That's $856 difference per month. On the other hand, my dad bought his house at 18% interest. Of course, that was on a $40,000 mortgage! Steve, I see you have a listing in our area, on Travis Street. There are 2 or 3 for sale on that street. Yes, suddenly, several homes on the market in the nieghborhood. 2 on Travis, 1 on Duncan, 1 on Keefer and 1 on Morton. Let me know if you'd like to see any. We are staying where we are on Duncan Way.